One of my favorite beef roast to make is Prime Rib. We always have on Christmas Day and I wanted to share with you my recipe and method of cooking. It’s such a wonderful cut of meat and when prepared the correct way can be simply amazing. It’s great for an elevated meal and really is rather simple to do. Just watch the temperature as to not overcook it. Give it a try! This is a perfect meal for a large or small dinner party. Enjoy! Directions: Preheat oven to 450°. In a small bowl mix together sour cream and horseradish, place in refrigerator until ready to use. Pat the roast dry . Season liberally with salt. In a bowl mix together butter, garlic and herbs. Evenly spread/massage the butter mixture over the entire roast. Don’t forget the sides. Place in oven safe pan and bake in oven for 25 minutes at 450. Reduce heat to 325° and the cook about 12-14 minutes per pound. Start with less time vs. longer time. You can always cook longer but there is no coming back from over cooked prime rib. For medium rare you want the temperature to be 120°, for medium you want temperature to be 130°. When you remove from the oven and let rest the meat should rise up another 10 degrees or so. The final temperature for medium rare will be 130° and for medium 140°. Let roast rest at least 25-30 minutes before carving. Serve with horseradish sauce and your choice of sides. Notes: This recipe will work for any size prime rib. The length of time cooking at 325° will be less for smaller roasts and longer for bigger roasts. Feel free to use other herbs to season the meat with. I forgot to get fresh herbs and dry herbs worked just fine. Really let the meat rest as this will help the meat come to final temp and be extra juicy. Make extra horseradish sauce if your like me and LOVE IT. 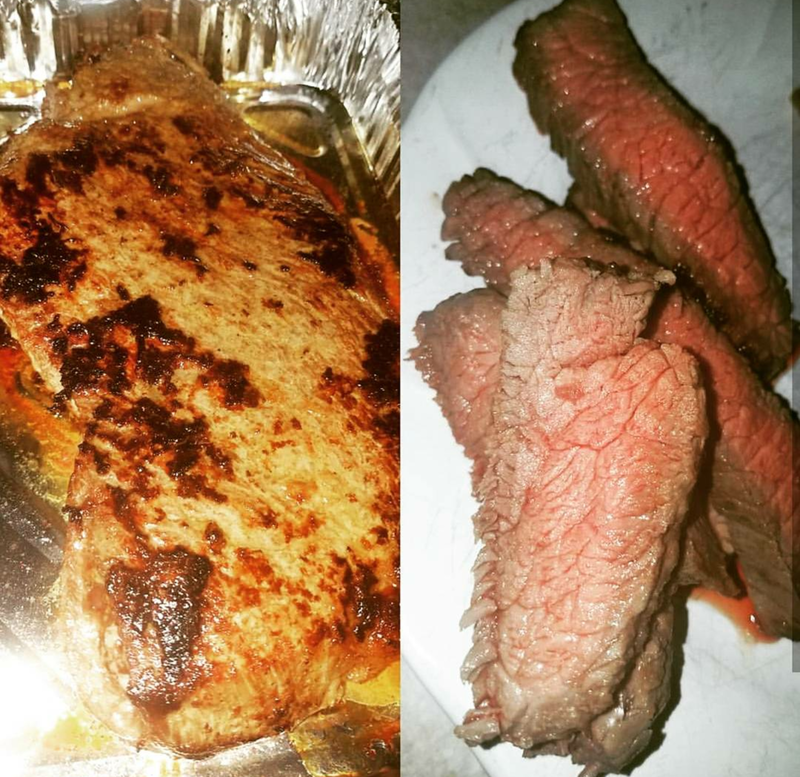 I hope you enjoyed my London Broil recipe yesterday. I wanted to quickly share with you a great way to use the leftover London Broil. I made a salad. It’s a great protein for a salad. It makes for a filling lunch and changes up the typical chicken that people use. Here’s what I did for mine. I love blue cheese and it goes very well with beef so it’s my London Broil Blue Cheese Salad. Take a look! Directions: In a large bowl add in the lettuce, and salad toppings above and any extra ones you’d like (minus the meat and the oil and vinegar.) Mix the salad well and drizzle evenly the oil and vinegar and mix till all lettuce is coated. Add to your dish and top with sliced London Broil and a final sprinkle of blue cheese then enjoy! Note: This dish can be changed up to any salad you’d like. It’s filling enough to be an entrée type salad. You will fully enjoy this. If you don’t like blue cheese change it up with another cheese. No rules here. I was just giving the way I made my salad. I don’t know about anyone else but unfortunately, I’m a big fan of red meat. I don’t eat it every day for obvious reasons (I’d like too) but when I’m trying to eat healthier I sometimes want red meat. Chicken, fish, pork and turkey can get old after eating it non stop. I picked up a London Broil one day at the store because I remembered my Mom making it so many years ago. For a while I wasn’t able to find the cut but now I can find it almost anywhere. I’m so happy about that! The good thing about the Top Round London broil is that it’s much lower in calories and fat compared to other cuts. In 4oz it only has about 170 calories and 5 grams of fat. It’s full of protein too! With that being said, I would recommend marinating the London broil as it can be slightly tough since it doesn’t have much fat. Now, does it taste like some of the greats like a Porterhouse, Rib-Eye or Filet mignon? No, it doesn’t! Nonetheless it helps the red meat cravings and it’s still a delicious dish that you’ll want to make again and again. Plus it’s healthier than the average red meat!! Check it out! Directions: In a bowl mix olive oil, Dijon mustard, soy sauce, Worcestershire and spices. Use a microplane grater to grate the garlic cloves into the bowl. Watch those fingers! Whisk all together until well blended. Put the beef in a zip lock bag, dump in the marinade and close bag and use hands to help coat the beef. Put in the refrigerator for 1-4 hours. Half way through flip the bag. Preheat oven to broiler. Remove the beef from the zip lock bag and let marinade drip off. Place in a broiler safe baking dish or sheet pan for 4-5 minutes and then flip over for another 4-5 minutes. 8 minutes will cook to rare and 10 minutes will cook to medium rare. Use meat thermometer for accurate temperatures to your preference. Once cooked remove and let rest before slicing. Serve with your choice of sides. Then enjoy! Check back tomorrow for a left over dish. Note: I have grilled the London Boil before, however, I’d put on there very quick with high heat as it will get tough. Two recipes in one day!! No way? 🙂 Yes way!! Tonight’s dinner was better than take out. By that I mean healthier than traditional Chinese food. It tastes very delicious but I won’t say it’s better than that greasy goodness that comes in those awesome white take out containers. I just won’t! However, it’s still very good and healthier. So put away that take out menu and keep reading for the recipe! I love Chinese food and unfortunately once I get the craving for it it’s like I have to have it within 24 hours or I’ll go crazy. Not really, well maybe a little! Beef and Broccoli is one of my favorite Chinese meals. I always feel like it’s healthier than my other favorite dishes that are fried. I’m not sure that is the case but I like to tell myself that. With trying to be healthy and make healthier food choices I decided to make Beef and Broccoli tonight. I had all the ingredients and felt like making something new. Below is my recipe for it. Like I’ve said before probably not an authentic take on it, but it’s my take on Beef and Broccoli. Get your chop sticks ready!! Directions: In a bowl whisk together 1/2 cup soy sauce, 2 T cornstarch, 2 T honey, 1 T Sesame oil, 2 T beef broth, minced garlic and onion and garlic powder. Set aside till ready to use. In another bowl whisk 1/4 cup beef broth and 1 T cornstarch then mix with the cut up beef. Heat a wok or large saute pan on high heat. 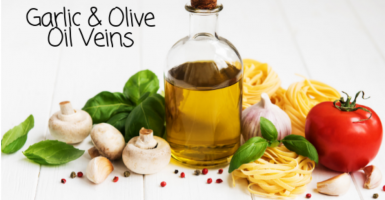 Add in the olive oil then add in the onion and cook for 2-3 minutes then add in the beef and cook about 5-6 minutes or until the meat is done to your liking. Whisk the sauce up again to make sure the cornstarch didn’t stick to the bottom of the bowl. Add half of the sauce into the the wok with the meat. Mix well and constantly. Cook for 1-2 minutes. Next add in the steamed broccoli and the remaining sauce. Again, mix well and constantly and cook about 2-3 minutes. Serve immediately and with white rice and top with chopped scallions. Note: If you like ginger feel free to add ginger to the sauce either fresh or the spice. I don’t care for ginger so I leave it out. When cooking the broccoli I do steam it before hand to it’s tender when I finish the dish. You will want to under steam the broccoli as it will be cooking a little in the wok as well. Tonight I had my favorite meal of meat and potatoes. I have 4 separate recipes in this post. The marinade for skirt steak, the Chimichurri sauce, a potato recipe and a mushroom dish. It is a complete steak dinner. I had been wanting to make skirt steak and I decided since it still feels like Summer here in Chicago I’d do it today. I made the marinade yesterday and had the meat marinating all night. It’s a good habit to marinade certain meats. Marinades add flavor to the meat, moisture and also some marinades help tenderize meats. Unfortunately, skirt steak isn’t super tender which is why I marinaded it over night. I went to the grocery store yesterday and had the butcher show me the skirt steak and the piece he showed me was too thin. I wanted to grill it and not have it turn into shoe leather. He then showed me the premium skirt steak. This piece of meat was HUGE! I had him cut it in half and he offered to remove the excess fat and also tenderize it. This was great! I figured one less thing I had to do. I paired the grilled skirt steak with a chimichurri sauce and a new potato dish and a deconstructed stuffed mushrooms. Take -a look at my complete steak dinner recipe below. Directions: Whisk all ingredients in a large bowl. Add in the meat and mix well. Put in the refrigerator for 4-24 hours. Rotating the meat a few times. Once ready to cook, heat grill on high heat. Let excess oil drip off and add to the grill. Cook 3-4 minutes on each side. Note: Cooking time will vary on the thickness of the beef. My skirt steak was pretty thin and I wanted to cook it on high heat and fast. Once cooked, cover with foil and let rest 5 minutes. When ready slice the skirt steak and top chimichurri suauce. See recipe below. Directions: Add all ingredients to a food processor. Pulse several times until all is minced up. Add more oil as needed. Once completed you can add to a mason jar or container and put in the refrigerator until ready to use. Notes: If you have a lime that seems a little to firm it may not produce a lot of juice. You can place in the microwave for about 10-15 seconds which will help get as much juice as possible. Also, watch the amount of garlic. It can become overpowering in the sauce. If this happens you can add a small, I mean small amount of sugar. Like no more than a half of teaspoon. This will help mellow out the flavor of the garlic. Directions: Preheat oven to 425°. Rinse large potato and slice with a mandolin using 3mm setting. Line a cookie sheet with foil, spray with cooking spray. Line the cookie sheet with the sliced potatoes. In a bowl melt the butter and add the garlic, parsley, onion and garlic powder. Brush half the butter on the potatoes and place in oven for 15 minutes. Remove the potatoes and brush with remaining butter mixture and put back in the oven for 5 minutes. Remove from the oven sprinkle with salt and serve immediately. Directions: Heat a medium sauce pan on high heat. Add olive oil to pan and then the garlic and mushrooms. Cook until they start to soften about 4-5 minutes. Add in the butter, spices, and the breadcrumbs and mix well. Finally add in the cream cheese till melted and then remove from heat and serve immediately. Note: This is my exact recipe I use to make stuffed mushrooms only it’s not stuffing them it’s mixing it all together. It taste just like the stuffed mushroom. It may not be as pretty of fancy but it’s amazing.